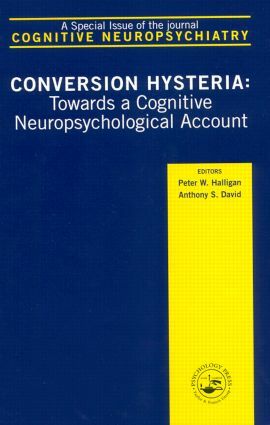 Patients with hysterical conversion present with striking physical symptoms such as weakness, sensory disorders or memory loss, that suggest a neurological disease but which show no evidence of brain and central nervous system damage. Although it is now over one hundred years since Breuer and Freud published their seminal Studies on Hysteria (1895) the story of hysteria remains controversial - even its existence as a viable clinical entity has been repeatedly questioned. Despite renewed interest over the past decade, most publications report little or no empirical research from the cognitive or clinical neurosciences. This is surprising given that the explanation of hysteria is still one where "the very notions of mind and body, and the boundaries and bridges between them are constantly challenged and reconstituted" (Porter, 1993). The rush to explain hysteria in terms of psychodynamics has so far proved elusive. Rather than developing further theories of hysteria, it is essential to charcterise those domains of normal volition and motor and sensory control that may be impaired, and from which it is possible to interpret observed symptoms. Only then will it be possible to provide a cognitively motivated account of how psychological mechanisms can translate (convert) into physical symptoms. As in other areas of psychiatry, it seems beneficial when explaining psychiatric phenomena to consider whether impairment to normal psychological phenomena can be used to construct a rational account of the underlying pathology. The aim of this special issue is to bridge the void left by the traditional over-reliance on psychodynamic accounts by emphasising putative cognitive and neuropsychological accounts of this puzzling and cotnroversial condition.